Bullis Charter School parents participate in hands-on activities at Back to School Night. 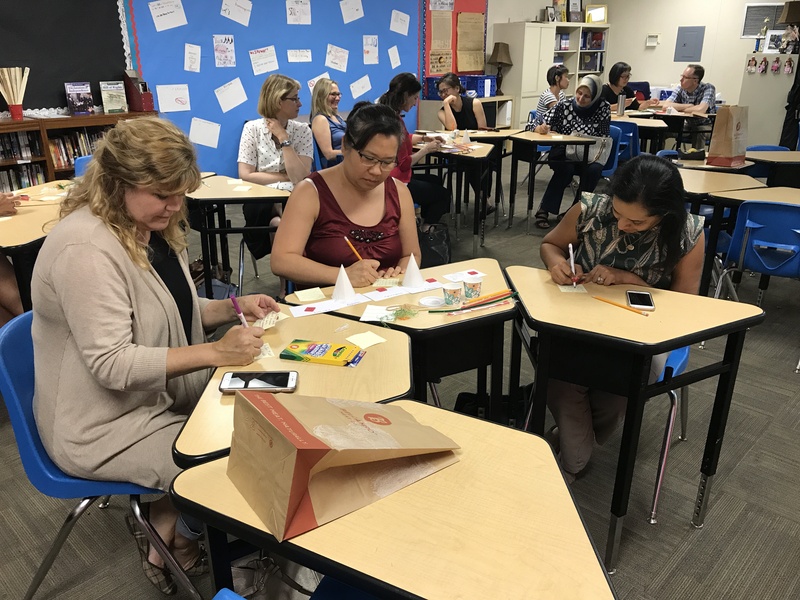 Bullis Charter School parents who attended the middle school Back to School Night Sept. 5 participated in a new format designed to engage them as partners in their students’ learning. Teachers created grade-specific videos of the information typically presented at Back to School Night and provided viewing access prior to the evening. Viewing them in advance enabled parents to experience through direct participation the learning opportunities available to their children. Parents were given a question – “How might we create something that will help our children stay organized?” – and worked in small groups to identify problems that challenge middle school students, such as time management, prioritization of assignments and physical organization of materials. Parents then brainstormed solutions by creating a 3-D prototype of a device that will help meet the organizational needs of middle schoolers. According to Bullis officials, each group rose to the challenge, designing solutions such as a task tracker with a built-in reward system, an organizational calendar that reminds students what to pack each day (PE clothes, sports gear, books, etc.) and an app that prioritizes students’ to-do lists based on due dates, time available and weight of grade.